For the past few months, scientists have watched with bated breath as a rift in the Antarctic Peninsula’s Larsen C ice shelf grows longer by the day. Eventually, the rift will make a clean break, expelling a 2,000 square mile chunk of ice into the sea. It’ll be an epic sight to behold—but what happens after the ice is gone? Glaciologists, who have been tracking the rift since it first appeared on the Larsen C ice shelf in 2014, are now scrambling to answer that very question. So-called iceberg calving is a natural geophysical process along the Antarctica’s frosty fringes; think of it as the planetary equivalent of your fingernails growing too long and breaking off. But this is one of the largest such events on record, with the potential to dramatically reshape the entire peninsula. Moreover, while there’s little direct evidence linking the Larsen C ice shelf breakup to climate change, scientists worry that the processes playing out here could be but a taste of what’s to come for West Antarctica, as rising air and sea temperatures cause this vast, icy mantle to weaken from above and below. Over 100 miles long, up to two miles wide, and lengthening at a rate of five football fields per day, the rift in the Larsen C ice shelf has been in and out of the spotlight since it first emerged on the eastern flank of the Antarctic Peninsula in 2014. Since punching its way through a section of softer, more ductile ice, the rift has followed a predictable pattern—periods of quietude, punctuated by sudden growth spurts—that experts say is typical of ice shelf calving. 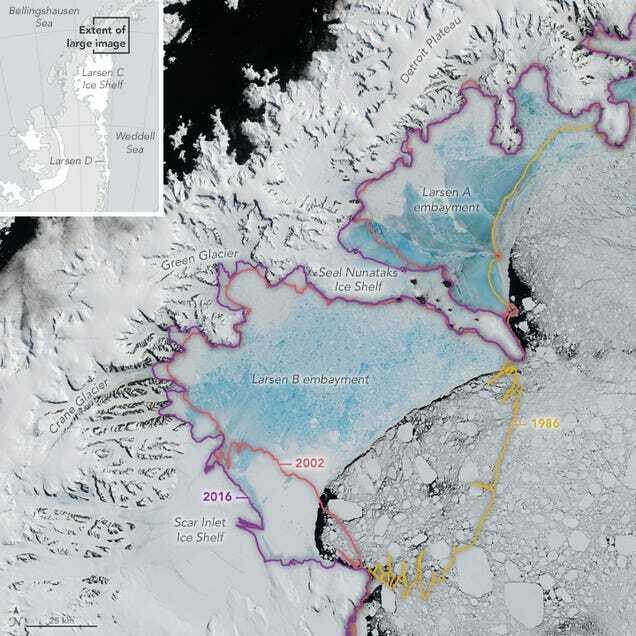 But over the last two months, things have accelerated “quite a lot,” according to Martin O’Leary, a glaciologist with the UK-based Project MIDAS, which is monitoring the rift via satellites. “Now we’re paying attention to every satellite image that comes through to see if it jumps again,” he told Gizmodo. 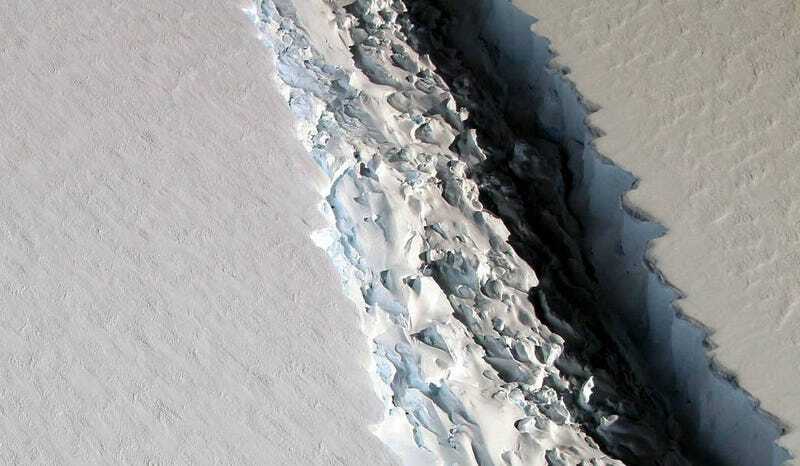 Having grown an impressive 17 miles (27 km) since December, the Larsen C rift has about 12 miles (20 km) to go before it reaches the other end of the shelf, snaps off, and spits out an iceberg nearly seven times the size of New York City. This could happen any day. “It could go tomorrow, it could go in a year’s time,” O’Leary said, adding that the ice “has to leave eventually.” That’s because additional ice is constantly pushing seaward from the peninsula’s interior, exerting a powerful shear force on the ever-weakening shelf. The good news is, we don’t have to worry about Larsen C’s breakup contributing to sea level rise. Ice shelves are, by definition, already sitting on top of water. “It’s already made its sea level rise contribution,” O’Leary said. Aside from possibly setting a few penguins adrift, the real concern with Larsen C’s imminent calving is what it’ll mean for the rest of the shelf—and for the ice currently tethered to land on the Antarctic Peninsula, which can still contribute to sea level rise, albeit probably just a few millimeters. Glaciologists often liken ice shelves to corks in a champagne bottle: remove them, and all the stuff they’ve bottled up starts to escape. This may be especially true for the Larsen C ice shelf, which appears to be snapping off at two crucial pinning points where land meets ice. In other words, Larsen C’s soon-to-be iceberg could be the tip of a much larger, proverbial iceberg, of an entire landscape reshaping itself. The changes glaciologists expect around Larsen C jibe with a bigger-picture pattern of ice retreat across the peninsula, including earlier calving events at the neighboring ice shelves Larsen A and B, which scientists have attributed to rising temperatures. “We may see that one this chunk of [ice] is gone, Larsen C [starts] becoming more vulnerable to climate impacts,” O’Leary said. 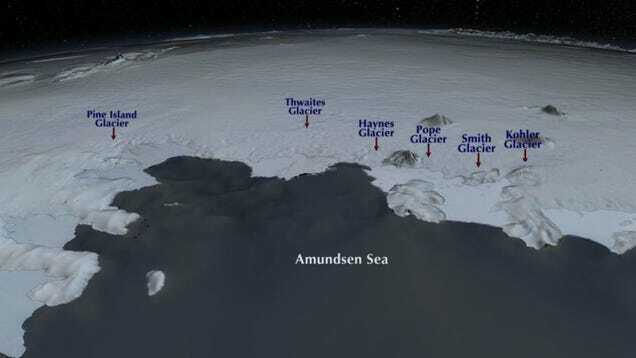 Most importantly to researchers, the breakup of the Larsen C ice shelf could be a harbinger of what’s to come in other vulnerable parts of West Antarctica, particularly the Amundsen Sea embayment to the south, where warming waters are already causing the enormous Pine Island and Thwaites glaciers to melt and retreat. A summary of a scientific workshop compiled last year by the National Snow and Ice Data Center warns that “a significant retreat of the Thwaites Glacier system would trigger a wider collapse of most of the West Antarctic Ice Sheet.” That entire ice sheet contains enough water to raise global sea level by 3.3 meters (over ten feet), on a timescale of decades to centuries. In other words, far more disturbing than the breakup of the Larsen C ice shelf is what it can tell us about our future.